America's obsession with the giant pickup truck started many years ago, back when gas was cheap and safety was a consideration that was second to most...but gas is still cheap when adjusted for inflation and safety is still something that people struggle to understand. So enjoy the good old days with this good old pickup. 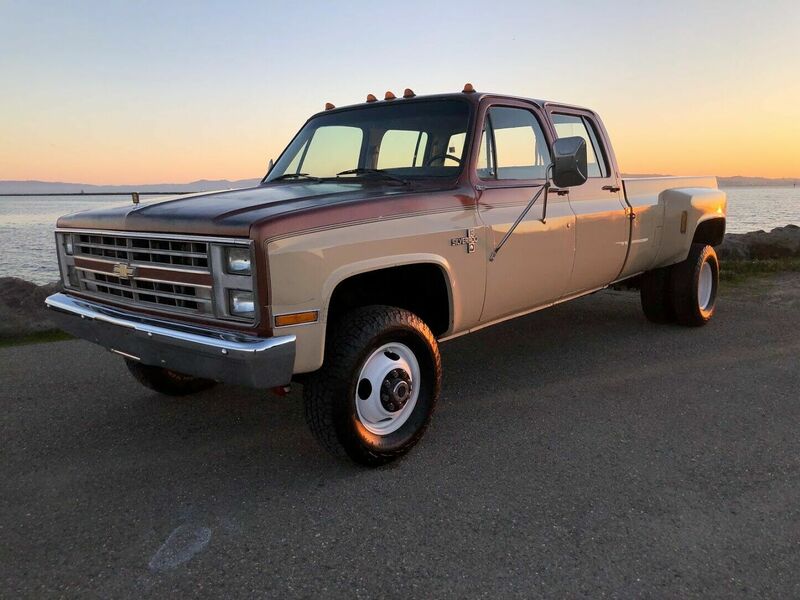 Find this 1986 Chevrolet C/K 3500 Silverado here on eBay bidding for $8,100 with 3 days to go, located in Oakland, CA. Up for a NO Reserve auction is a beast of a truck, a 1986 Chevrolet K30 crew cab dually with 118,886 original miles. This truck was ordered new in Sacramento, California in 1986 and lived most of its life in Truckee, CA nestled in the beautiful Sierra Nevada mountains and later to Reno, NV. Simply put they just don't make trucks like this anymore and finding good examples are getting harder to find. This truck wasn't some company work truck that was beat and abused everyday, instead this truck was special ordered with all the right options. Powered by a 454cid big block V8, Turbo hydromatic 400 transmission, full floating Dana 60 front axle with 4.10 gears and a full floating Corporate 14 bolt in the rear with 4.10 gears. The truck is equipped with the "Big DOOLEY" package with 2 tone Canyon Copper and Tan original paint. It is the top of the line Silverado trim package as well being a Camper special complete with power plugins and wiring harness, 94 amp generator, heavier duty springs and steering stabilizer, engine oil cooler, transmission cooler, and a heavy duty radiator. This truck is built for a purpose and has the capabilities to tow your house and your boat up a mountain while comfortably seating your family of 6. What makes this truck more special, is it was never used very much in its 33 years of life it was driven on average 3,600 miles a year and still has the original paint. 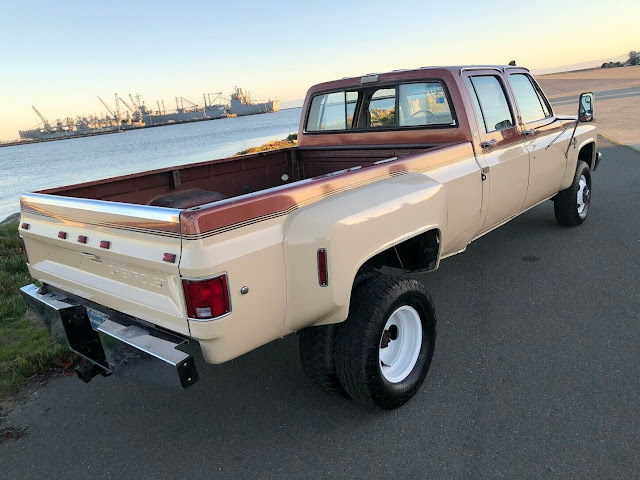 Squarebody trucks are in demand and have proven to be a safe option to put your money, a factory crew cab 4x4 dually with original paint is a hard one to duplicate. Don't miss out on an opportunity to find a desirable and capable truck being listed with No Reserve. This thing is begging for a lift kit, 40" tires and some truck nuts. I'm not a "truck guy", but I would say this thing is just about perfect as it sits. No need for "penile compensation decoration". If anyone is looking for a 2wd camper hauler of the same vintage, this one popped up on SD's CL today. Buyer wanted. Must love tan.